Show off your school spirit with our College Futon Covers with FREE Shipping. These futon covers made by College Covers are a hit with college fans everywhere! Each futon cover fits a standard Full size futon mattress and offers a beautiful print with your favorite college logo and mascots. What better way to show team spirit for your college than by way of a college themed futon cover? You can add a significant splash of color and style to your dorm by showing off your team spirit with one of these gorgeous covers or remind everyone who your Alma Mater is by showing off a gorgeously bedecked futon in the colors of your college school. 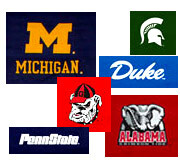 At DCGstores.com, we have a wide selection of college futon covers in order to allow you to show off that spirit! Place your college themed futon in your den or media room and let everyone know exactly who you're rooting for every time! Many colleges and houses host contests during the year to showcase team spirit within the dorm rooms. What finer way to display that spirit than with college futon covers? Not only are futons almost always found in college dorms and houses, but futon covers are an inexpensive way to keep your futons looking colorful and fresh. Futon covers are sturdy and easy to clean making them a perfect accessory to allow your college spirit to shine! Our sturdy cotton duck covers will wash and clean easily and retain their bright colors showing off your spirit in the best way possible. A college dorm tends to have a limited amount of space and as such it's a pretty good idea to choose furniture pieces that can do double duty whenever you can. A futon makes a great addition to a college dorm area because not only can it provide an extra bed for visitors, but it converts into usable seating otherwise. Decorating your futon with a college futon cover will also pull in your college pride and spirit for all of your friends to see. Futons are also extremely reasonably priced which make them ideal for college students on tight budgets and the ability to remove and wash a futon cover is an added bonus. All of those late nights studying, the food and drinks, the dorm can take a toll on regular furniture, so having a washable college futon cover gives this piece of furniture even more frugal usability! There are a couple of important things to look for when selecting the right futon cover for your futon. The first is fit. In order for your futon cover to look its best upon the mattress, it needs to be sized correctly. Pay special attention to the thickness of your mattress and the measurements of your futon cover to be certain that they will work well together. Another thing to watch for is material. The college futon covers sold at DCGstores.com, for example, are 100% cotton duck which will give you a long lasting and sturdy futon cover. Our 200 thread count assures that you will have a comfortable seat that is pleasing to the touch.